It’s been more than a year since I made my first camp chairs, so Gregor and I went back to the drawing board to make a couple of minor improvements. Changes include a slightly lower back (less weight, less bulk, less “throne-like”), a personalized nameplate, personalized device in the top back, and more precise construction. 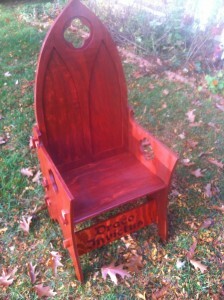 So far we’ve cut out four chairs and finished one — the prize for Cynnabar’s Grand Tourney tomorrow (see photo below). 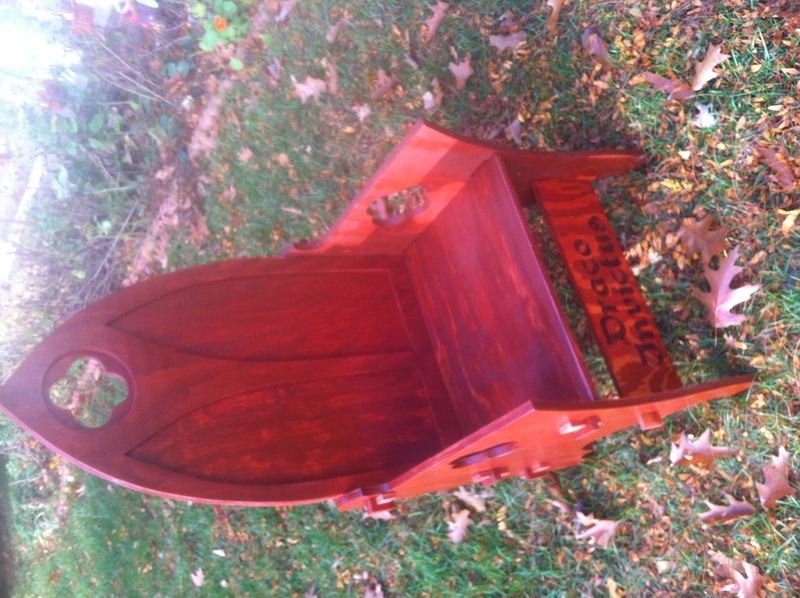 For this prize chair, we chose to put “Draco Invictus” on the nameplate and then allow the winner to choose another name for a new plate if s/he wishes. For the new chair, we also tried a different staining method as we weren’t really pleased with the staining on the last chairs. This chair has a coat of stain (traditional cherry) and a separate coat of polyurethane. We like this better. The three other chairs are for Gregor, Alexander, and myself, and they are all personalized with our device in the back (horse, crystal, and winged heart respectively) and a plate with our names at the bottom. They are sanded and ready for staining. These chairs are made of sturdy plywood and break down completely flat. The wood was cut out on a CNC Router ShopBot so everything is precise — this is one of my favorite aspects of this chair. I am happy to share the files I created for the Shopbot– I’ve linked them below. This chair can also be made with a jigsaw hand tool, as I did that with version 1 (and those chairs are still holding up great — I just wanted to make new versions). You can use the PDF or Adobe Illustrator files below to see how to cut the wood out, either by CNC Router or by hand tool. My family and I are intending to get back into SCA once we’re moved this coming summer to the Gulf Coast. I like the version 2 chair design you came up with. Do you have a template/pattern that can be emailed? I’d like to utilize it and modify the size parameters so I can build one for my 7-year old daughter. Thanks for your time. I would love the plans for this type of chair. If you can email them to me or send them by Facebook. I would also love the plans for this chair, where can I find them? See the bottom of the blog post which now has the plan files in four different formats. I too would like the plans if you could share. Portable Clothes Rack for Events, Camping, and Gold Key (Wood Garment Rack) Level Up to Our Second Pennsic: Even Better Than Last Year!